An MBTA commuter ferry leaves Quincy en route to Boston in 2008. The T says it is permanently canceling its Quincy ferry service and selling its terminal there. The MBTA is permanently canceling Quincy ferry service and selling the ferry terminal and wharf on the Fore River – saying the site is in dangerously poor condition and the repair cost is prohibitively expensive. He estimated that making the property usable for five years would have cost the cash-strapped MBTA about $15 million, and more comprehensive repairs lasting 50 years would reach $50 million. The MBTA will continue to provide extra ferry service from Hingham to make up for the loss of the Quincy boats, which have been running to Boston and Logan Airport since 1996, Pesaturo said. The boats also went to Hull. The last boat left the Quincy terminal on Oct. 14 with 222 commuters on board, he said. Service stopped the next day after a water main break exacerbated structural problems with the 55-year-old sea wall and wharf and state engineers determined the area was not safe, Pesaturo said. MBTA officials said at the time that the terminal would be closed for at least six months and directed commuters to use other transit options, including the Hingham ferries. 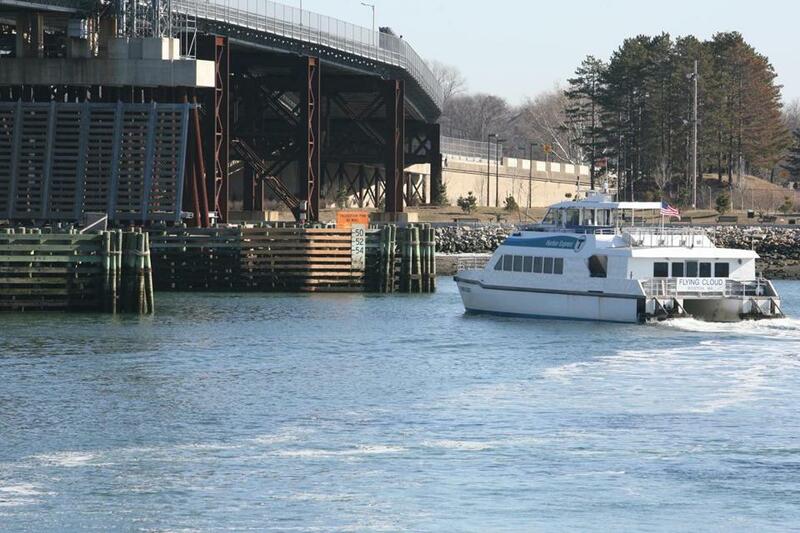 The MBTA has doubled service on the Hingham boats, Pesaturo said. In January 2014, ridership on the Hingham commuter boats was 68,138 passenger trips, compared with 54,616 passenger trips in January 2013 – when the Quincy boat was still operating, he said. She added that Boston Harbor Cruises had no interest in buying the Quincy terminal, which sits at the mouth of the Fore River. Bewick, whose Harbor Consultancy International company is based in Hingham, said the property was an important part of the emergency evacuation plan for Boston, could play a key role when the nearby Fore River Bridge is replaced, and provided tourists with easy access to the Boston Harbor islands. She said the site also had potential as an off-site parking area for Logan Airport, and recommended that the Massachusetts Port Authority ask the MBTA to take the property off the market until its other public uses were reviewed. Pesaturo said the “process to dispose of the property has been initiated” and appraisers are determining its value. Next step is to issue an “invitation to bid,” he said. “Obviously the property will be sold to the highest bidder,” he added. The property includes the pier leading to the USS Salem, a retired Navy cruiser that was built in the nearby Fore River shipyard in the 1940s and has been operating as a museum since 1995. The Salem has been closed since September 2013 because of safety issues with the pier. While the future of the museum-ship is uncertain, the MBTA will help maintain “critical functions” such as heat, power, and bilge pumps on the USS Salem, Pesaturo said. “The MBTA has determined that until the property is sold, it is in its best interest to keep the ship stable and secure,” he said. Pesaturo said the first signs of problems at the Quincy terminal surfaced in late 2011 when rushing water from a broken main pushed the sea wall away from the shore. Investigation revealed that much of the steel supporting the wall was severely deteriorated, he said. Further investigation in 2013 showed more extensive damage; the water main break last fall led to even more damage and large cracks in the pavement leading to the gangway used to get on and off the boats, he said. Safety concerns led the MBTA to suspend ferry service, at first temporarily and now permanently, Pesaturo said.